At birth, the tiny deer was about 6 inches tall and 6 inches long. camera (Courtesy of Wildlife Conservation Society ) A photo released by the Wildlife Conservation Society shows the world's smallest deer species, born at the Queens Zoo in New York. Check out this adorable photo of a pudu -- the world's smallest deer species -- that was born less than one month ago at the Queens Zoo in New York City. The fawn, a male, was born May 12, the Wildlife Conservation Society said in a release today. But his little white spots are just characteristic to juveniles, the Wildlife Conservation Society said, and will fade as he ages. At birth, the tiny deer was about 6 inches tall and 6 inches long, weighing in at about one pound, said Barbara Russo of the Wildlife Conservation Society. As adults, pudus grow to about 12 to 14 inches at the shoulder, Russo said. 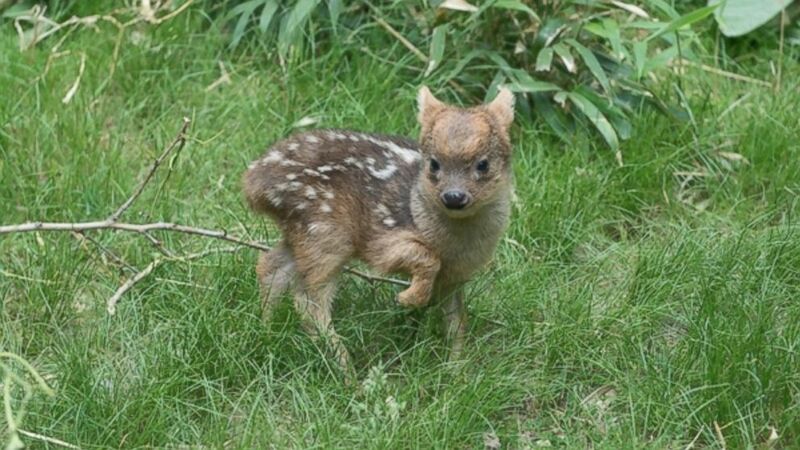 The fawn is the third pudu to be on display at the Queens Zoo.